Today's Staff Feature Friday shines the spotlight on our 6-12 Vocational Agriculture Teacher, Mrs. Danielle Wolfe! 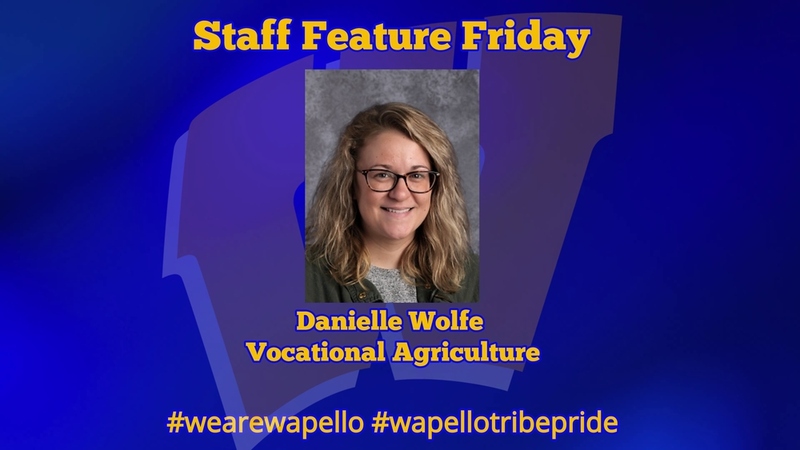 Mrs. Wolfe is in her third year of teaching Vocational Agriculture at Wapello High School. She came to Wapello after teaching in her field for two years prior to joining the Wapello Community School District Staff. Mrs. Wolfe holds an Undergraduate Degree in Agricultural Education from Iowa State University and is currently pursuing a Masters Degree from Iowa State. Her family includes her husband Rusty, and their two dogs, Luke and Annie. In her spare time, you can find Mrs. Wolfe spending time working outside around her home and enjoys spending time with friends, family, and her dogs. When we asked Mrs. Wolfe what she likes best about working at the Wapello Community School District, she responded with "Relationships that we are able to make with our students!" Congratulations Mrs. Wolfe on being selected for our Staff Feature Friday! Check back next week for another staff member to be featured!